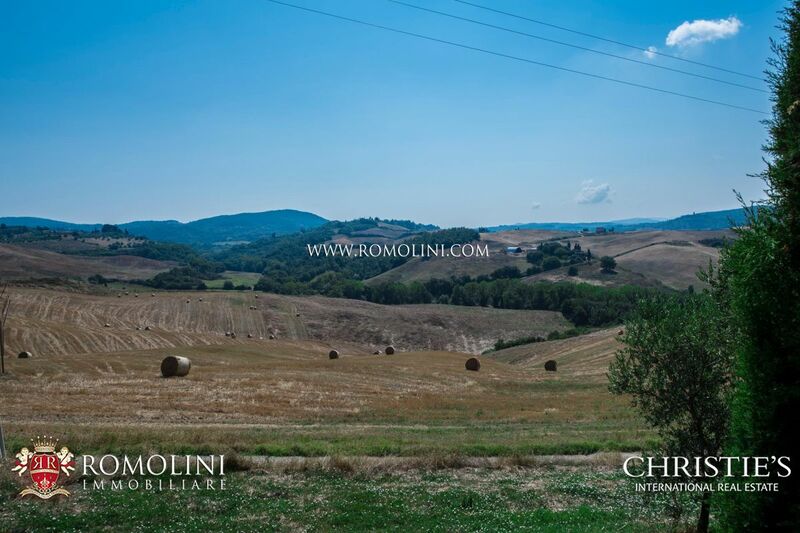 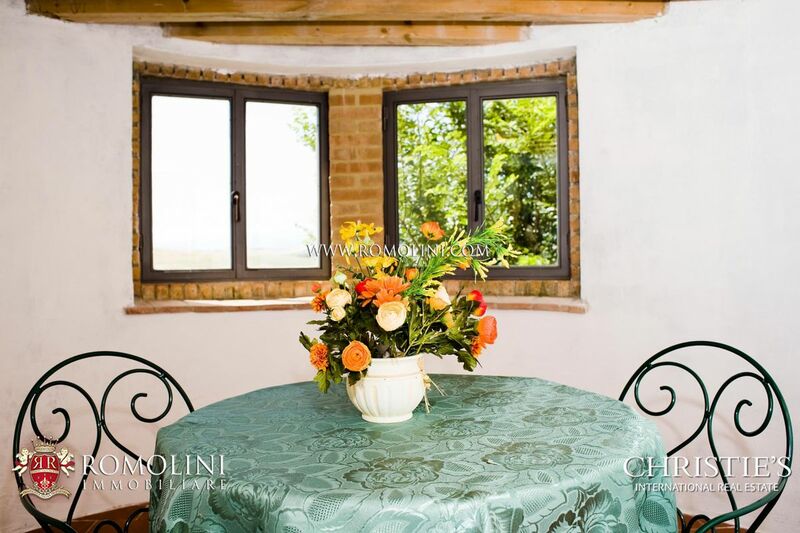 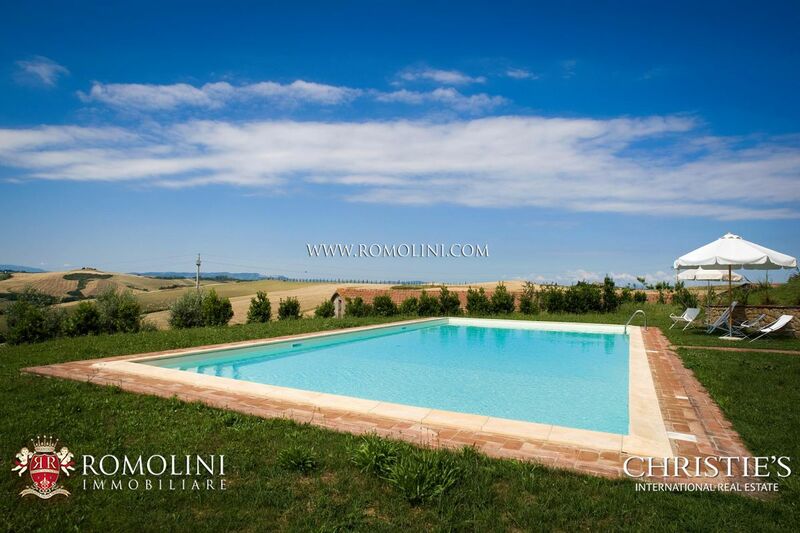 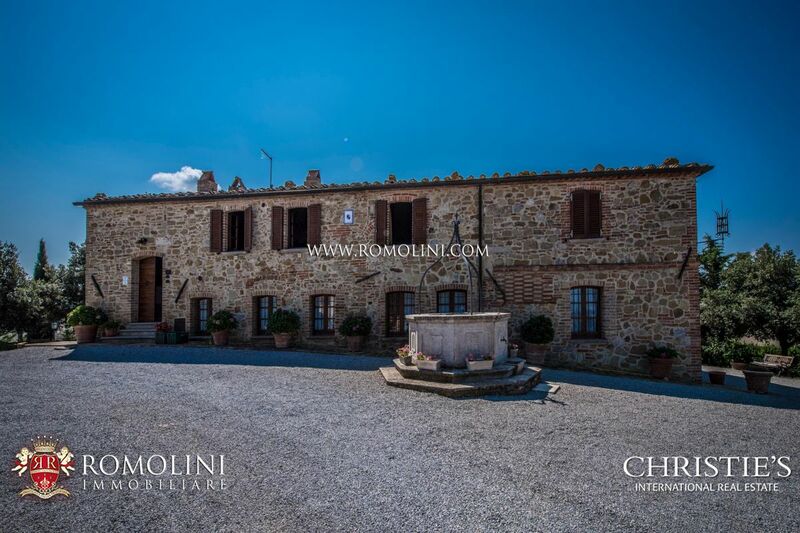 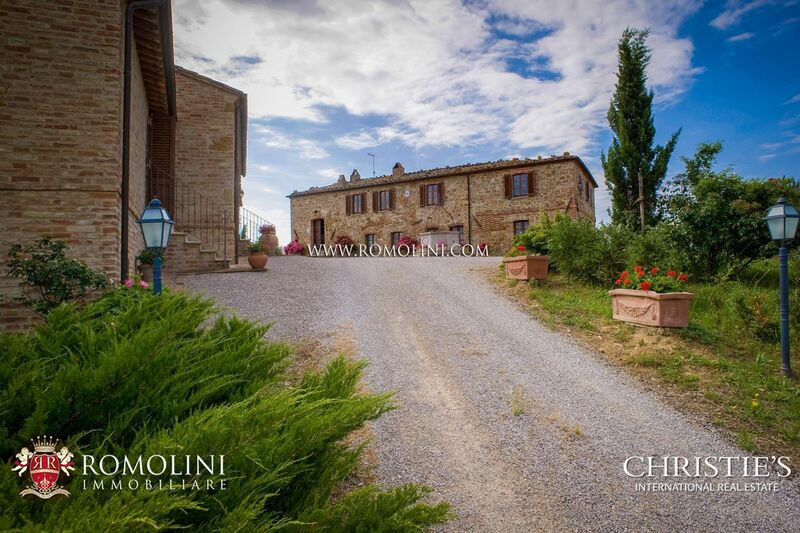 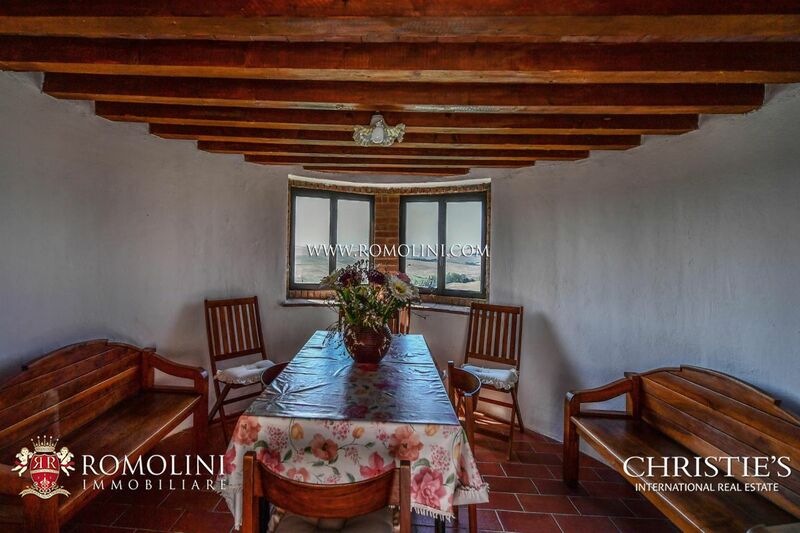 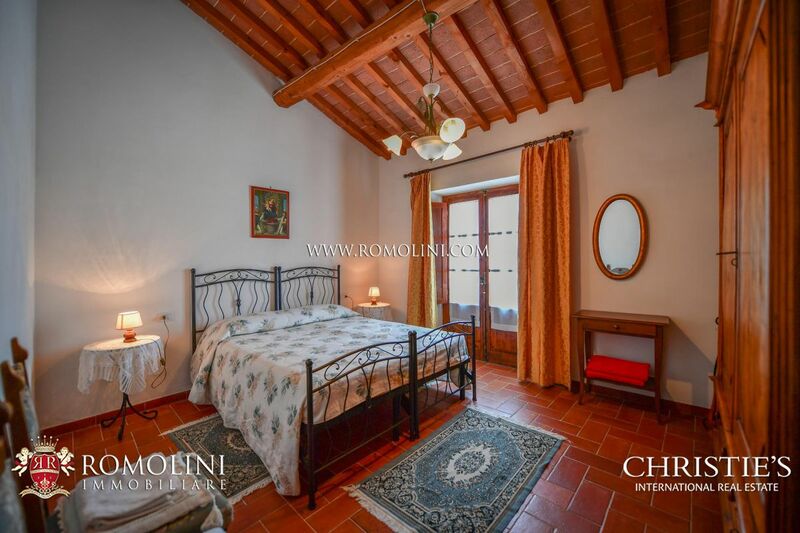 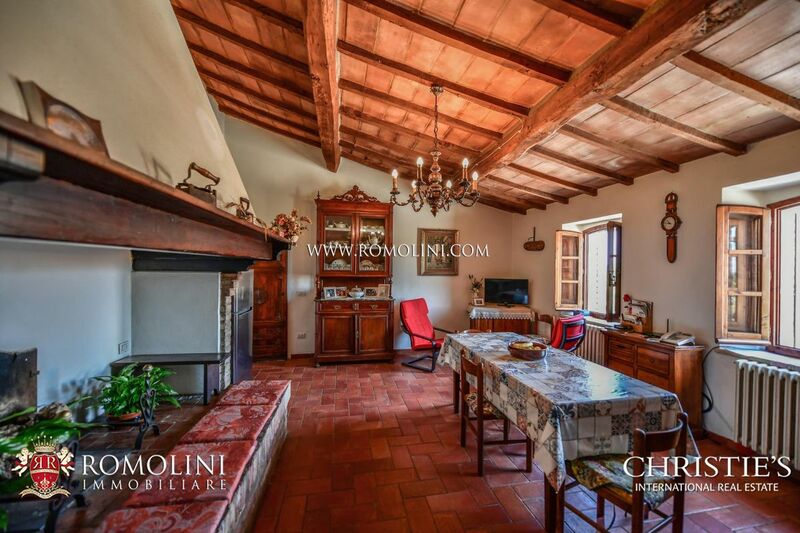 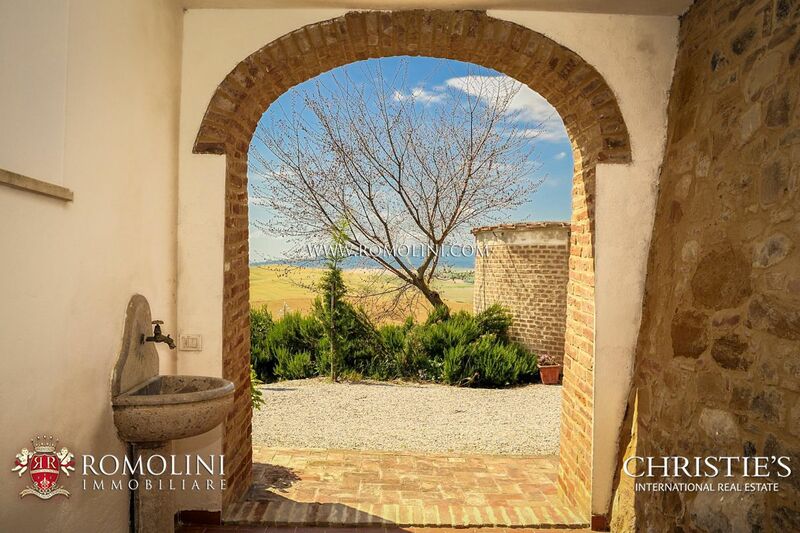 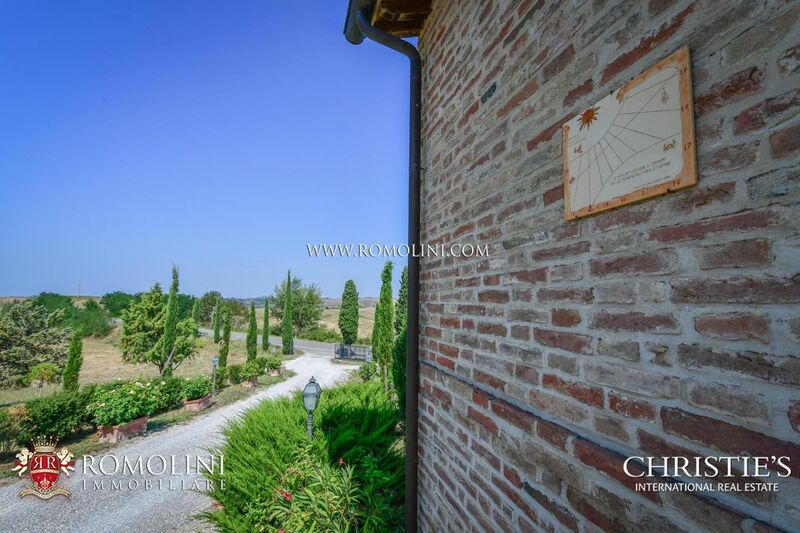 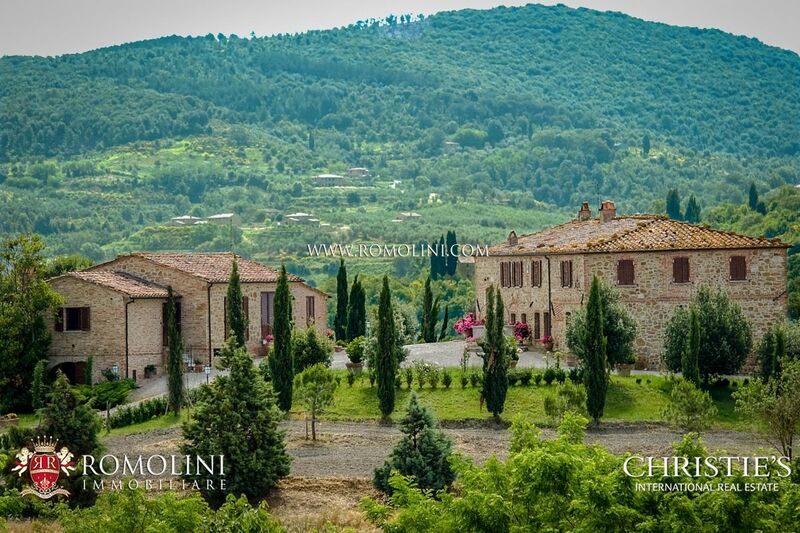 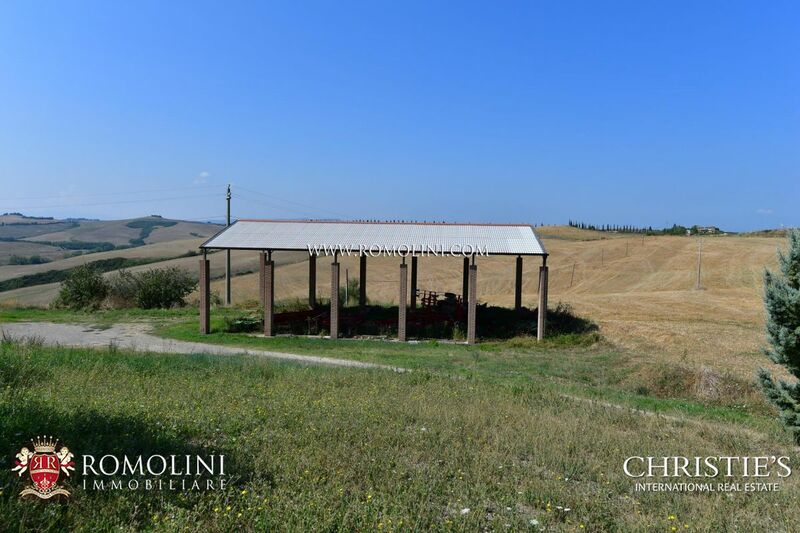 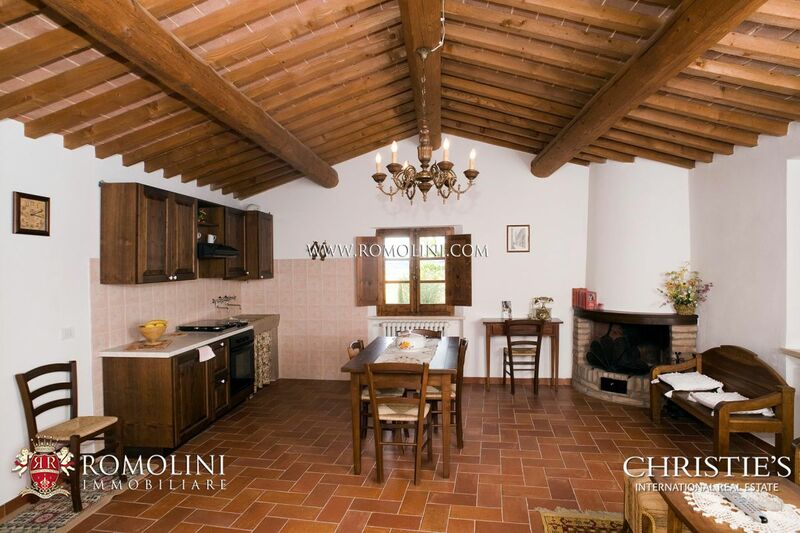 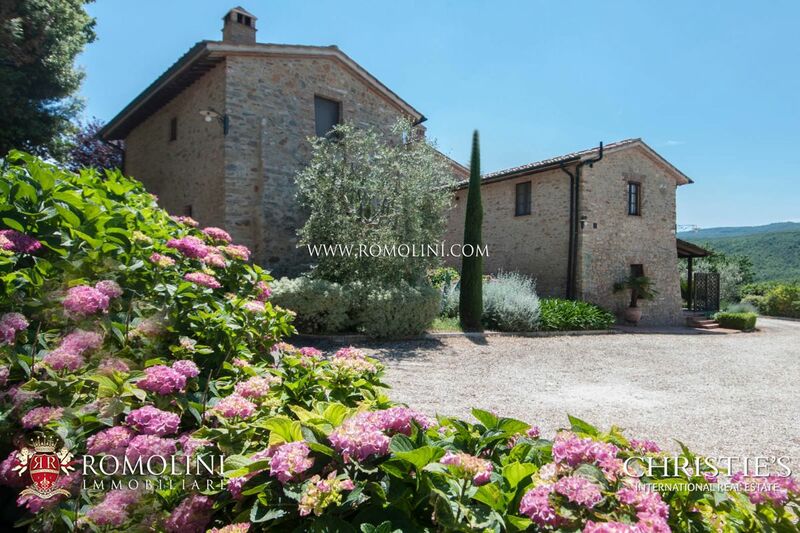 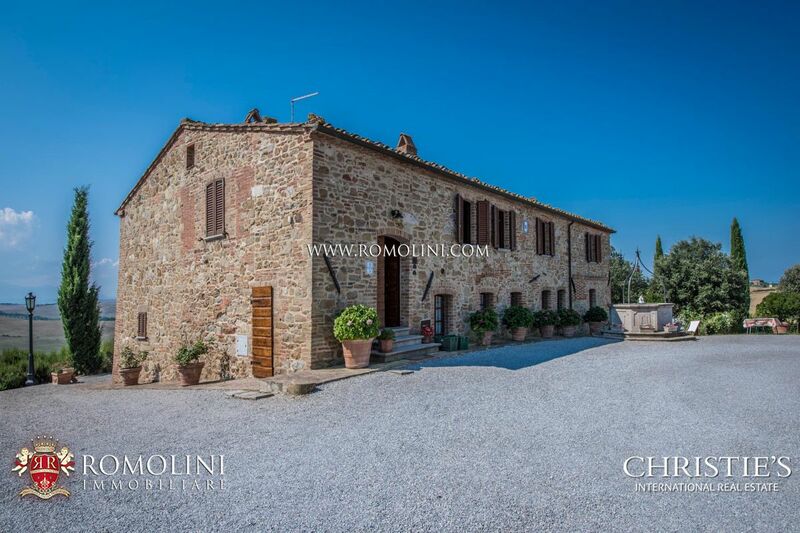 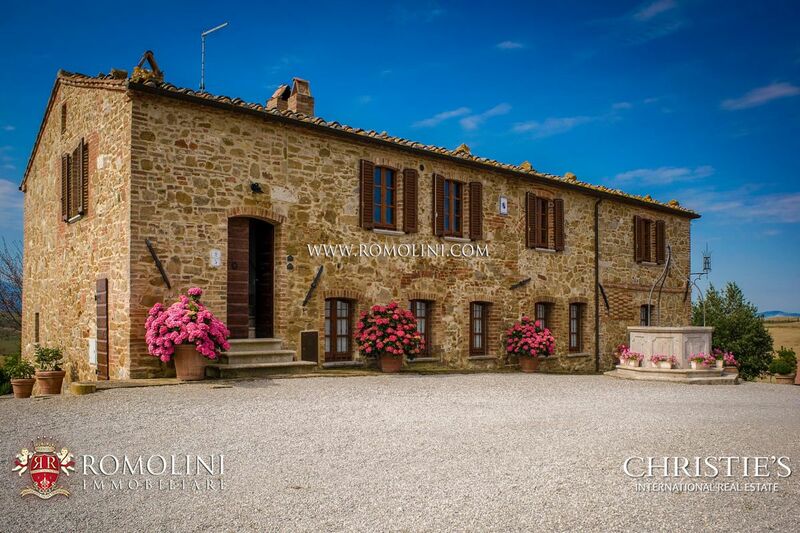 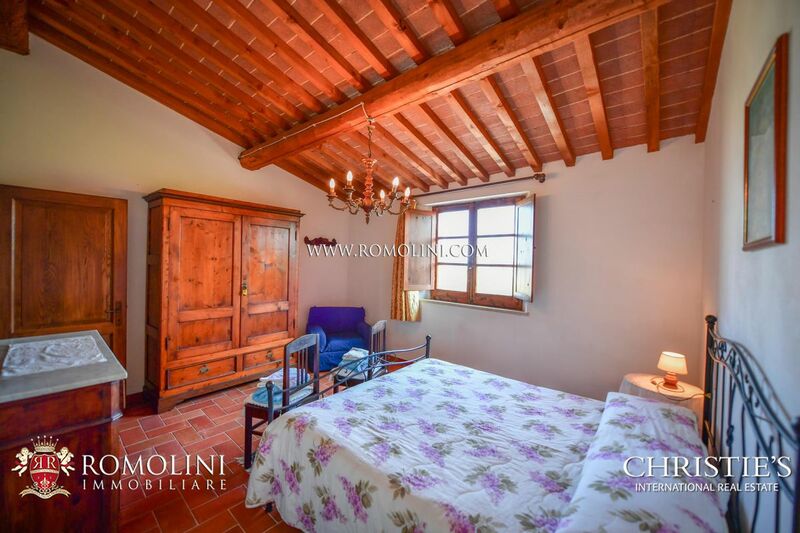 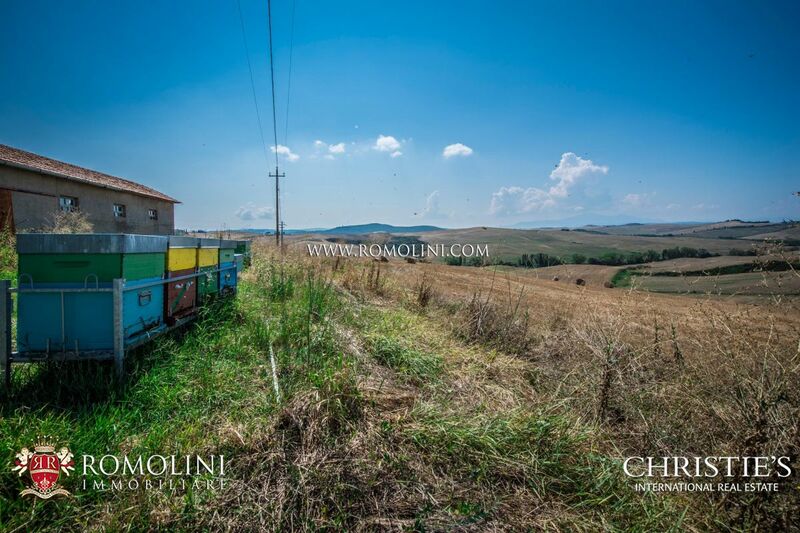 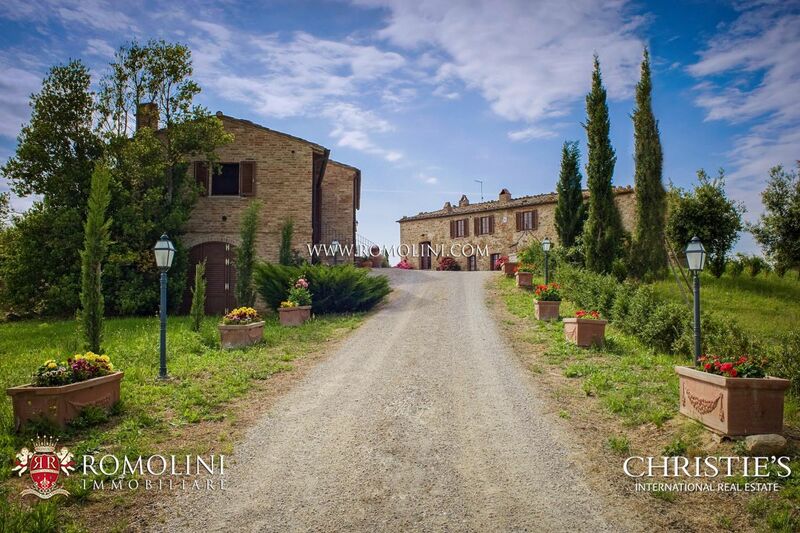 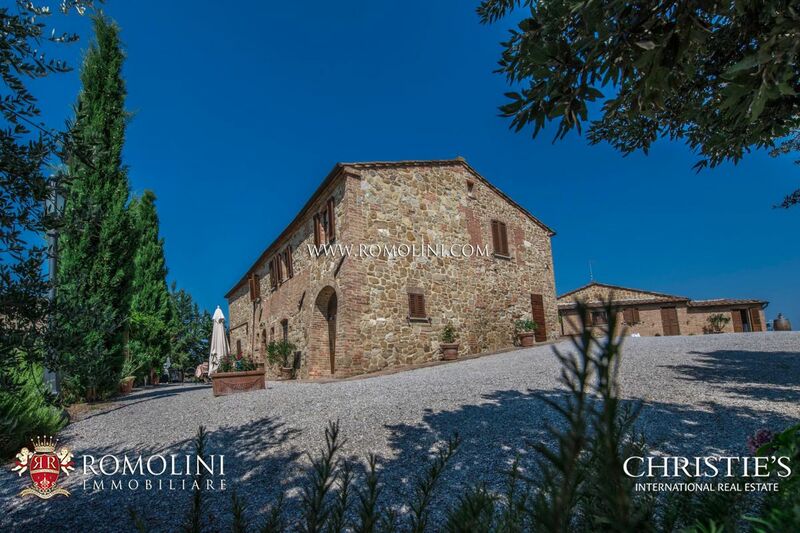 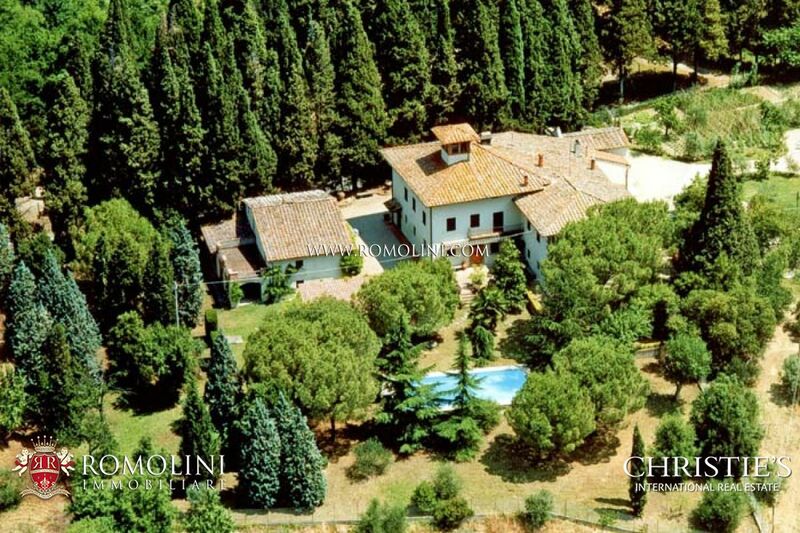 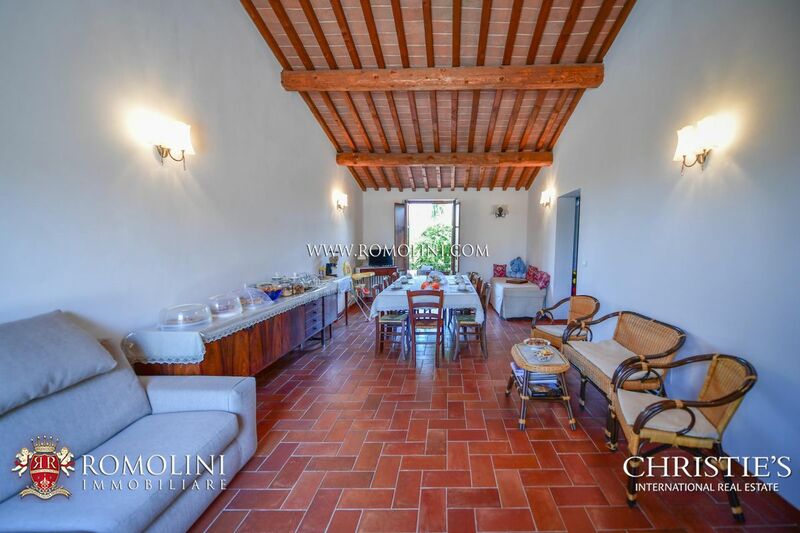 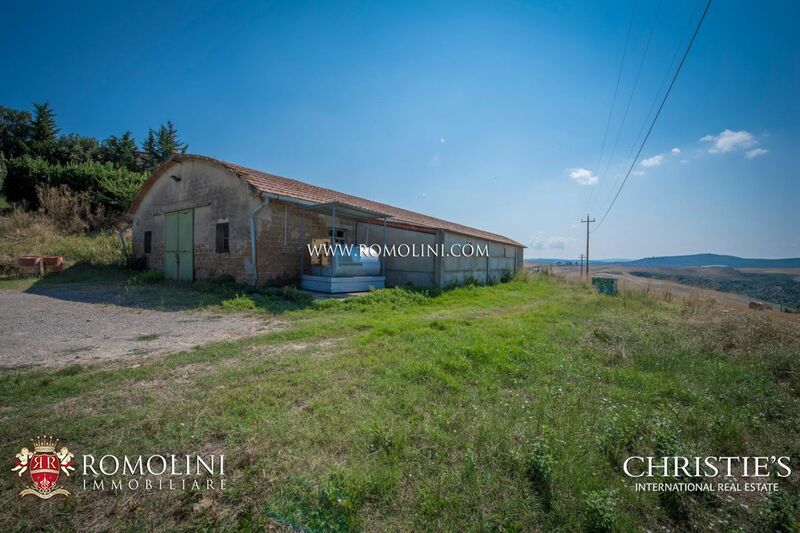 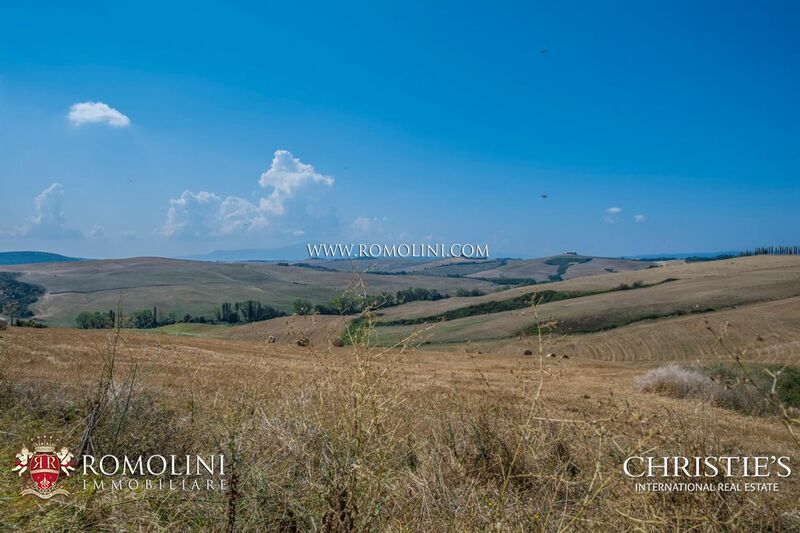 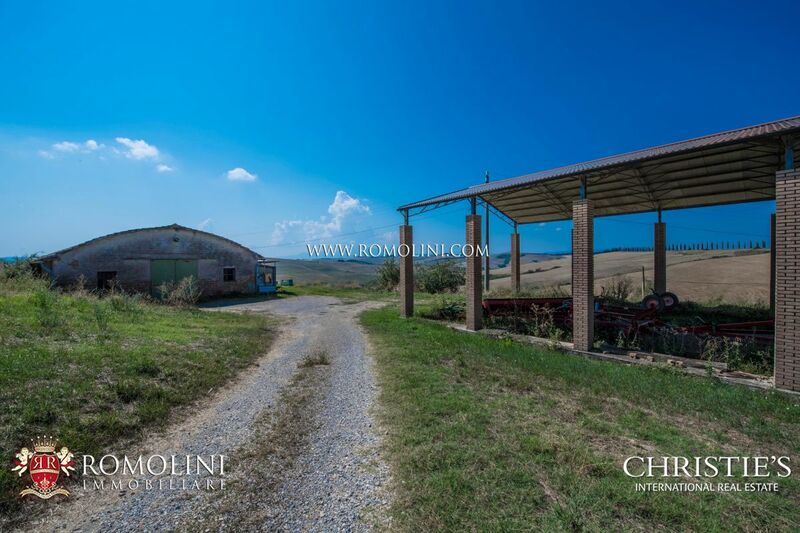 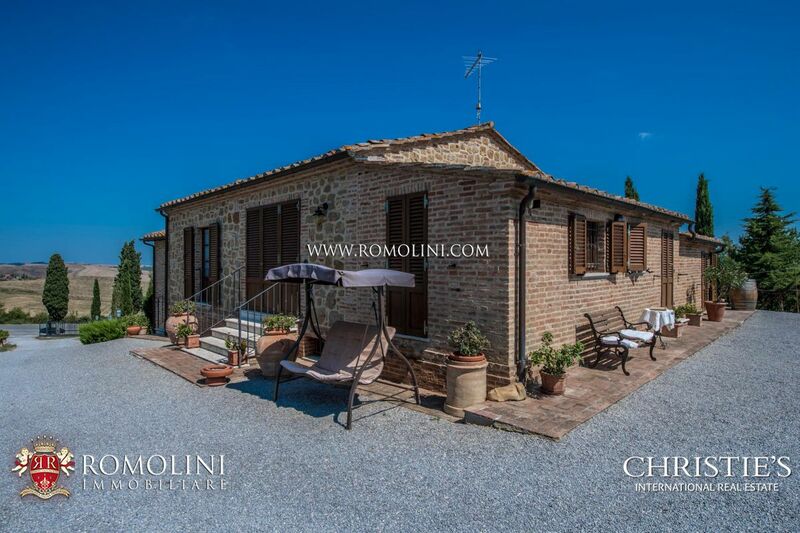 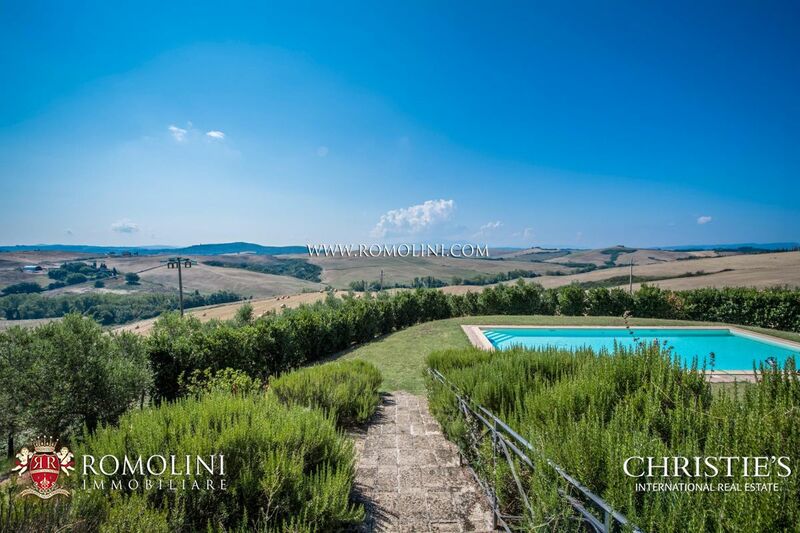 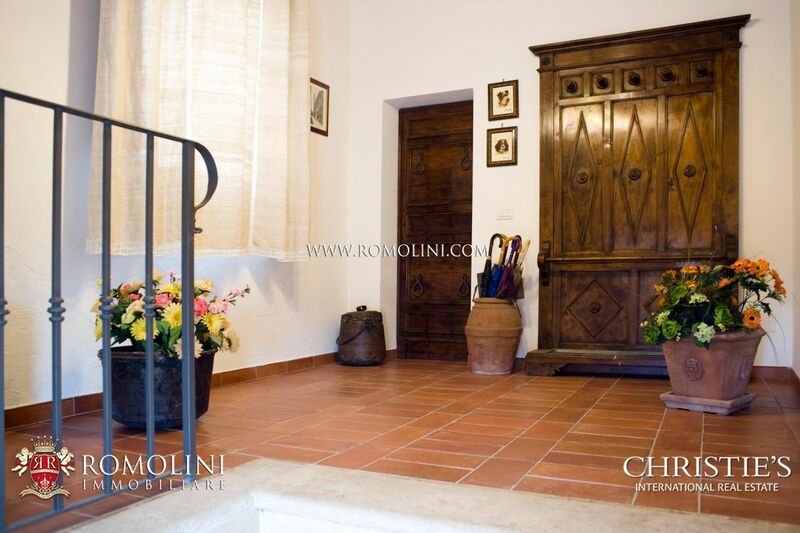 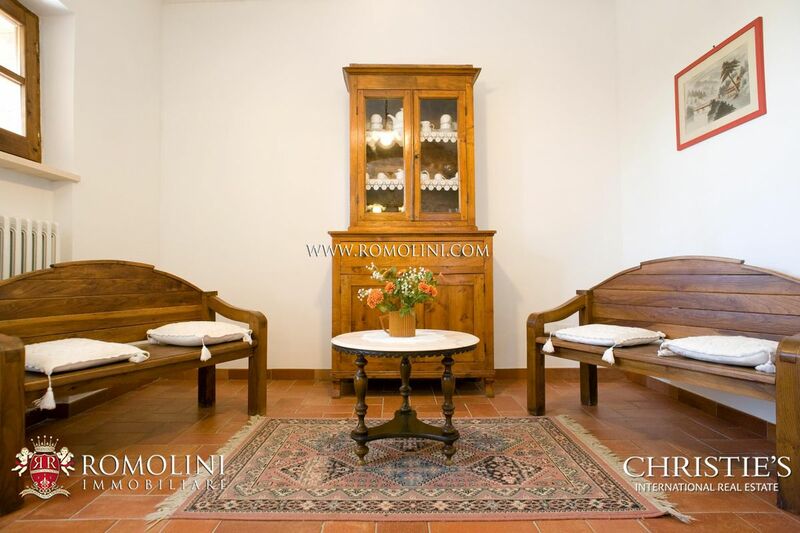 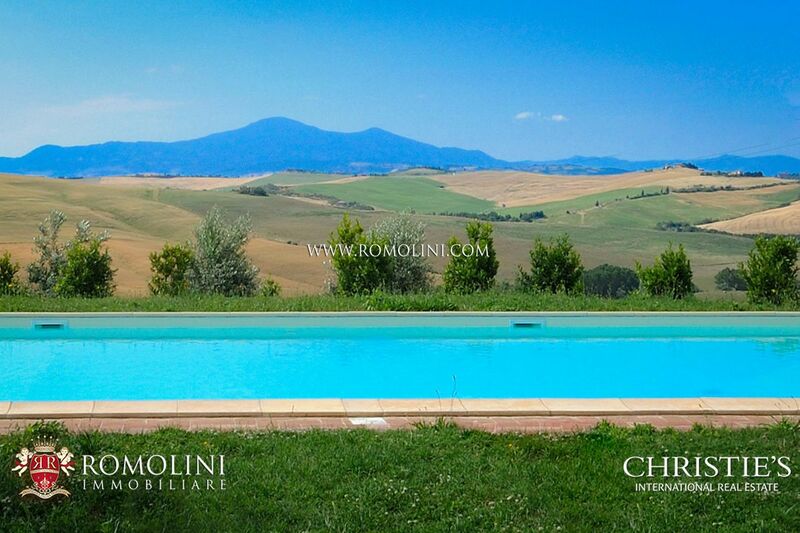 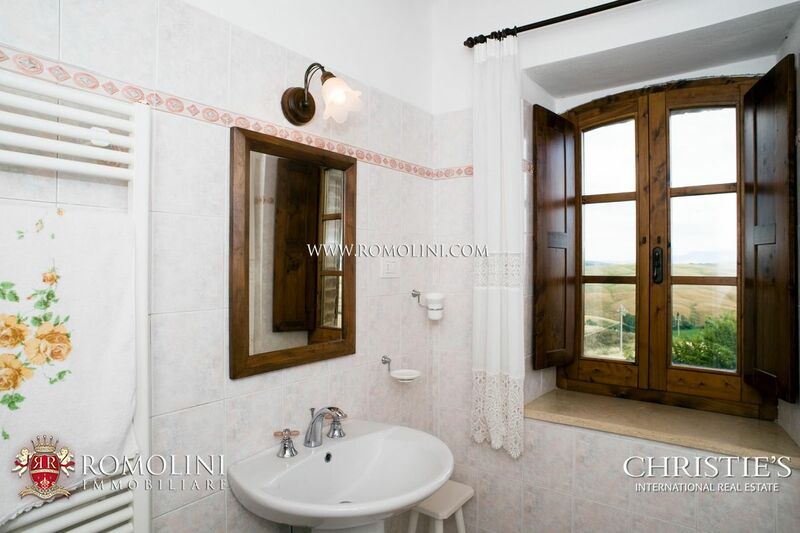 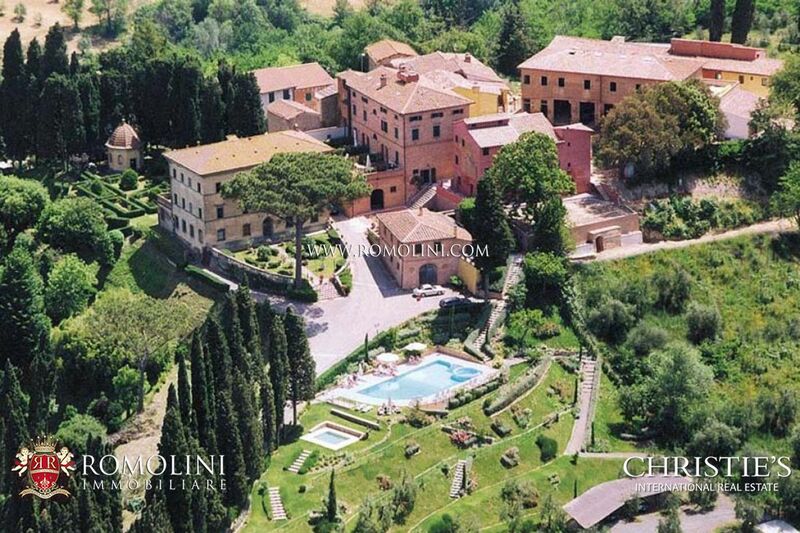 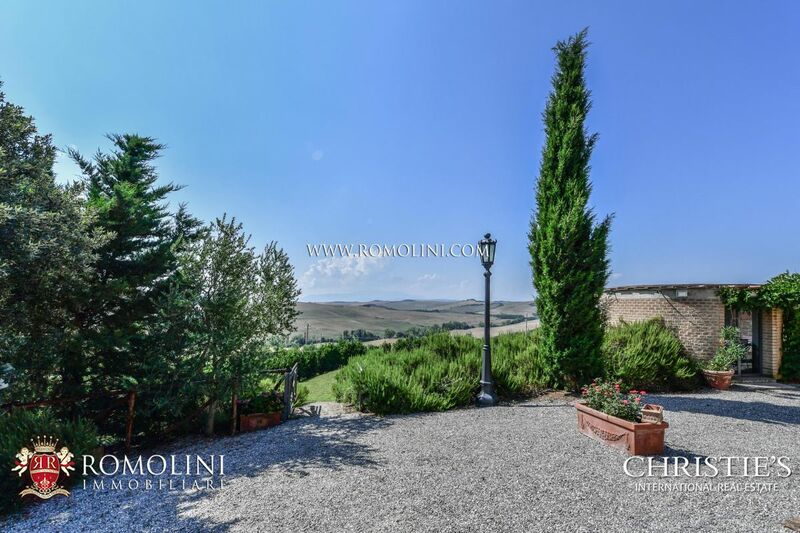 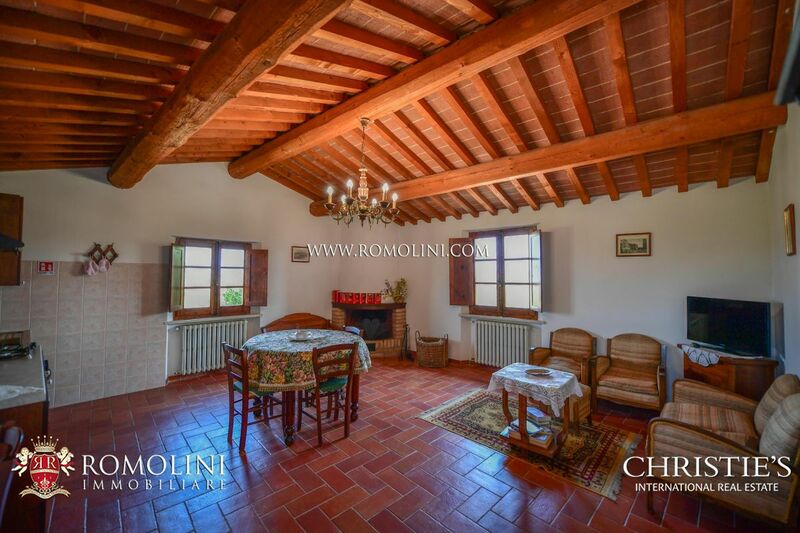 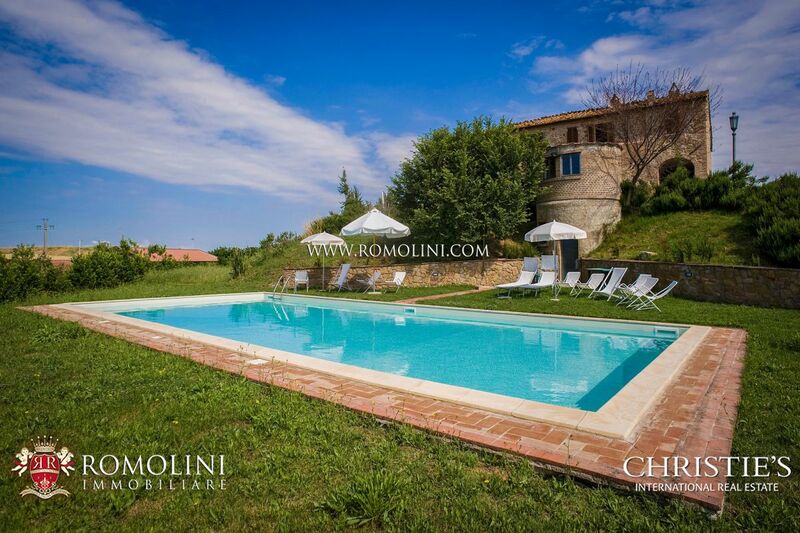 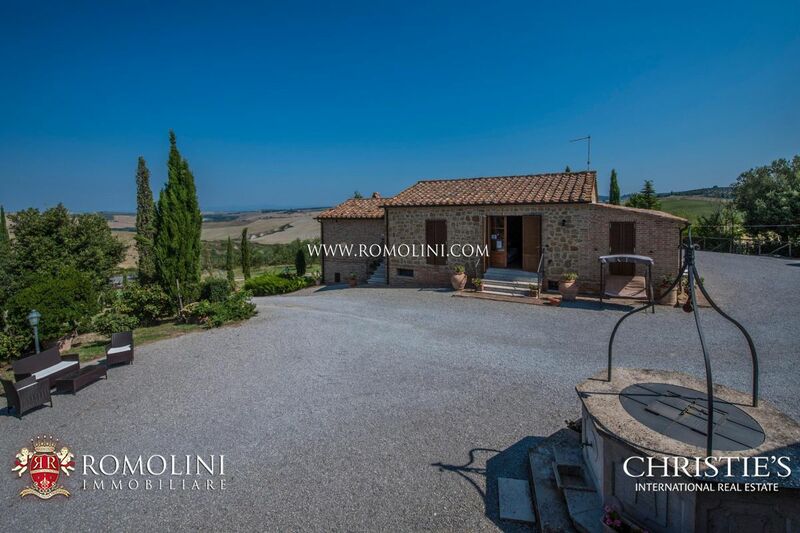 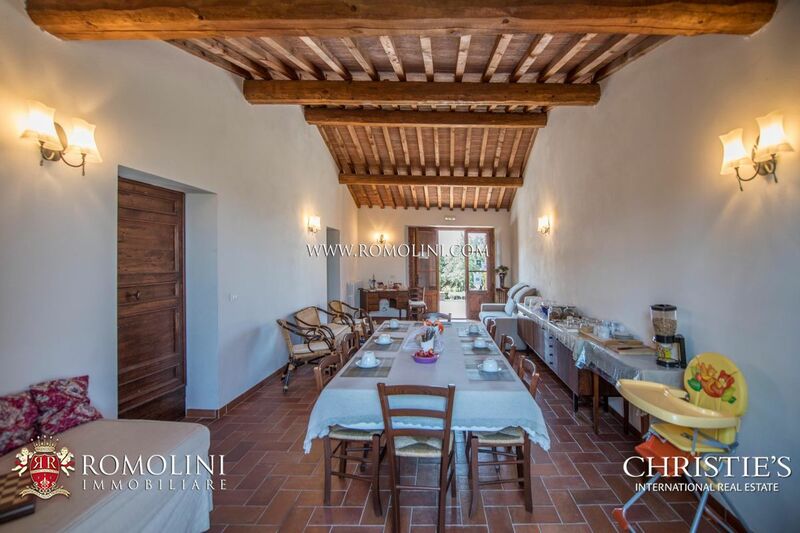 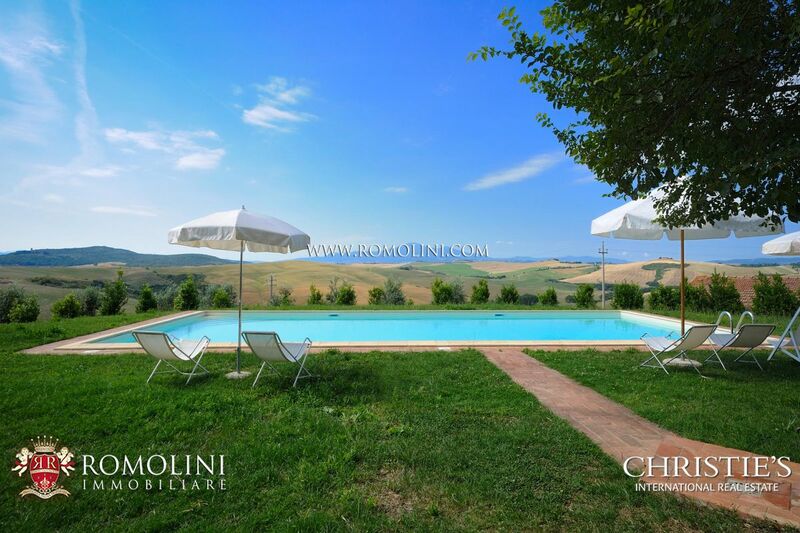 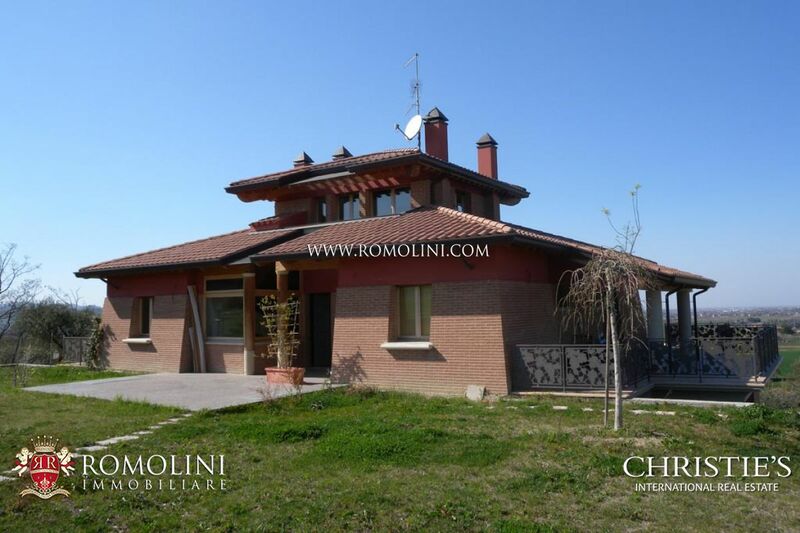 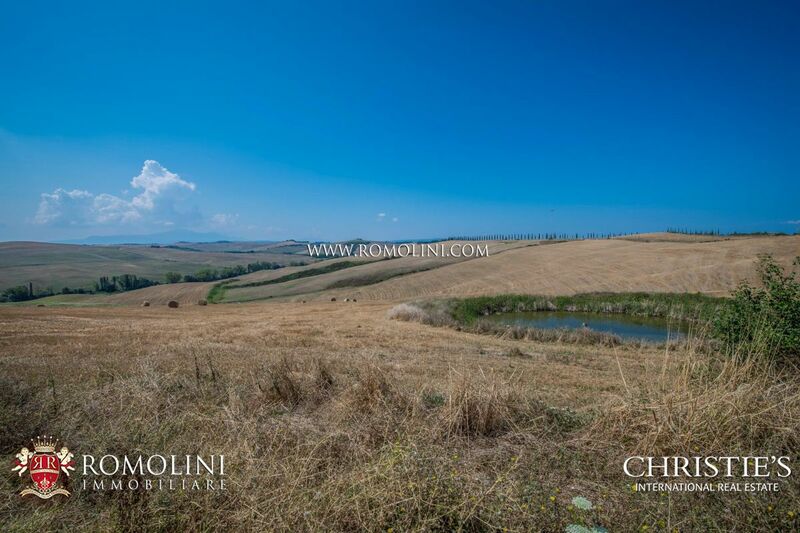 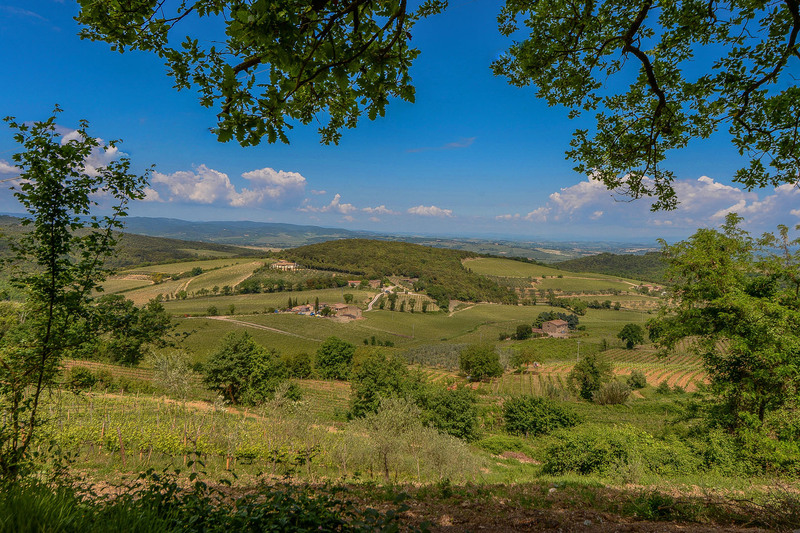 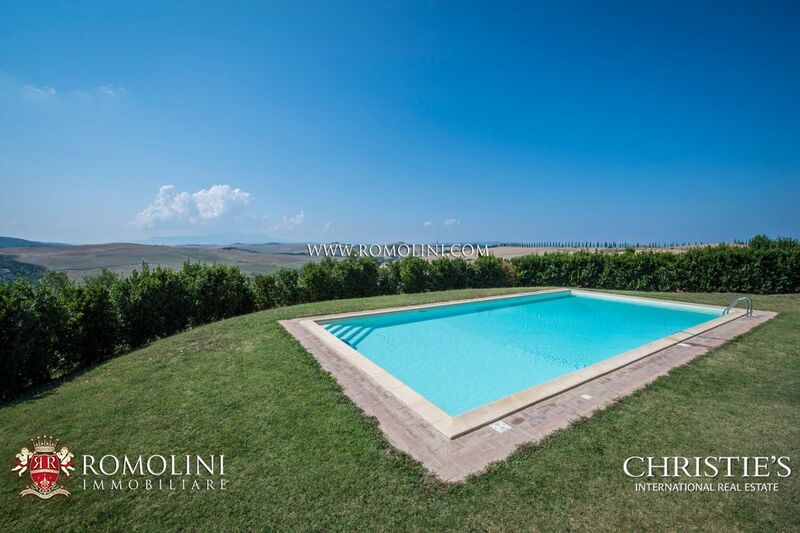 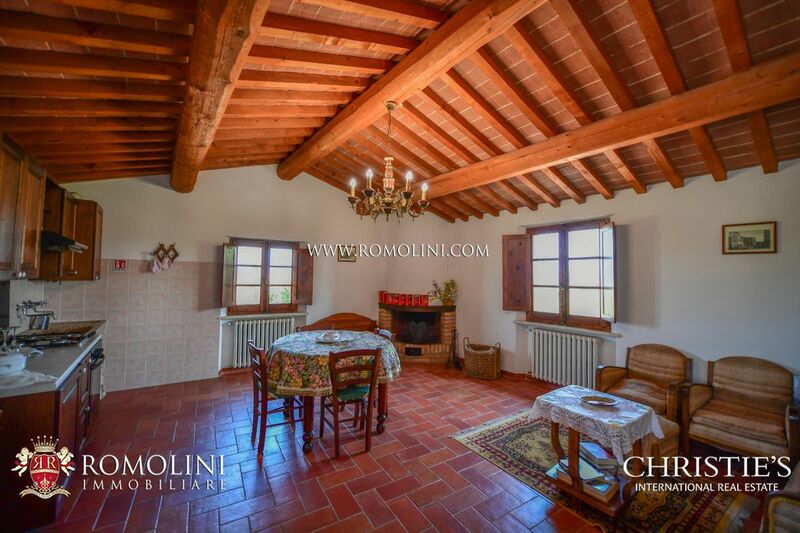 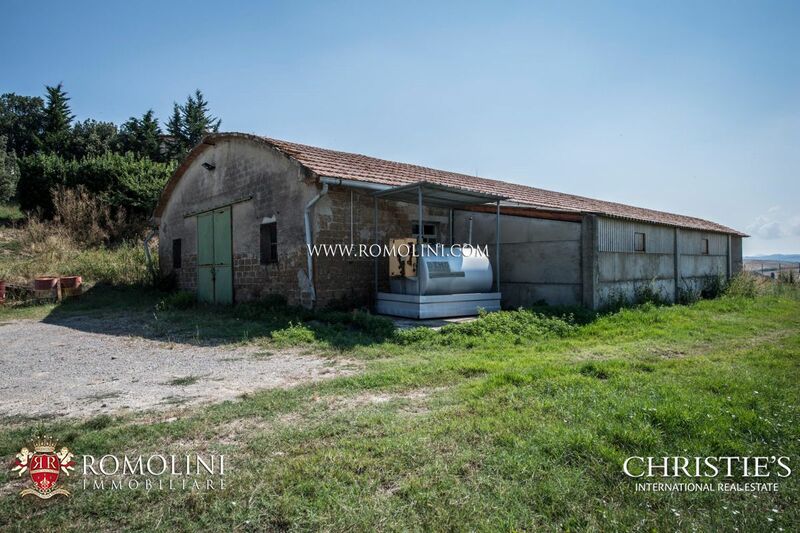 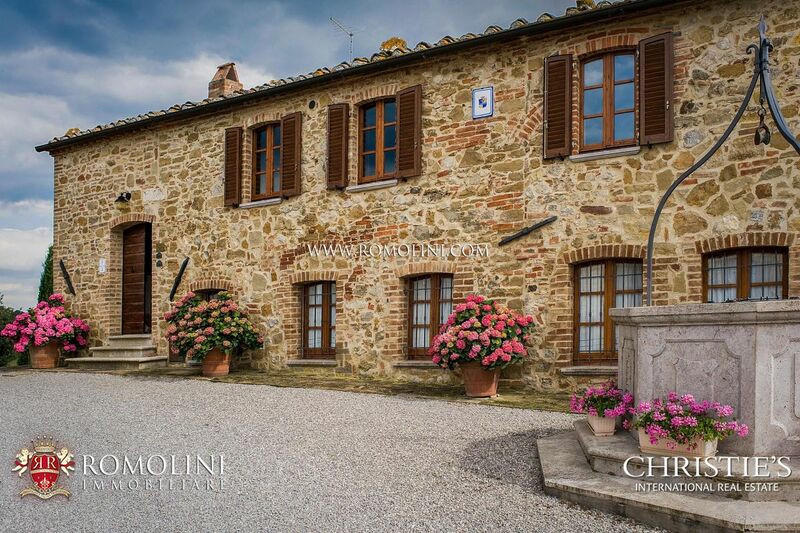 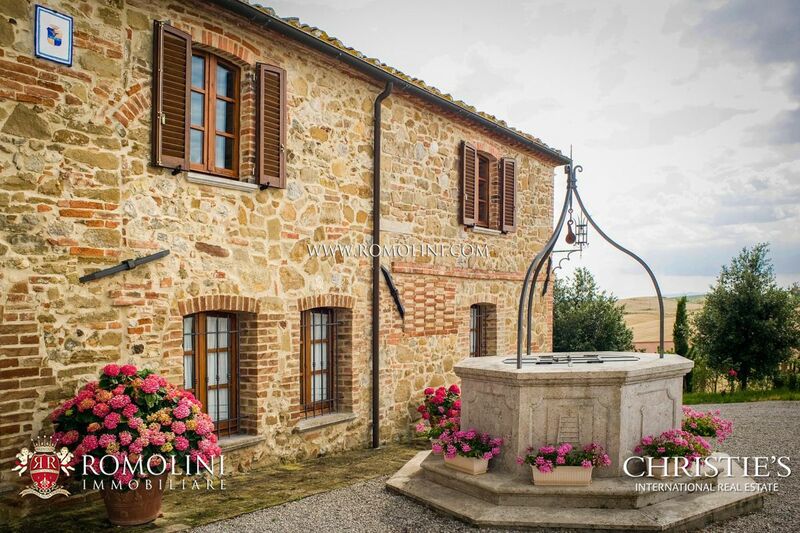 In a hilly and panoramic position not far from Montalcino, in the Tuscan countryside, estate of 43.2 hectares with farmhouse and guest house, currently run as Agriturismo. 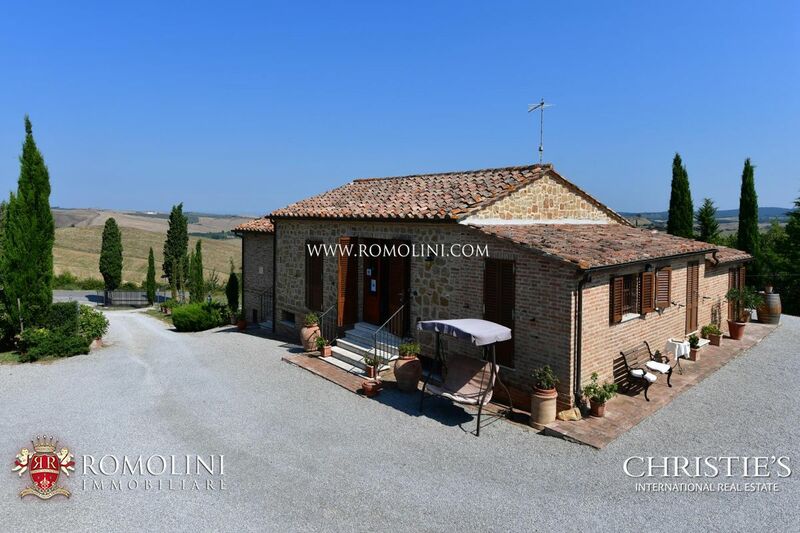 Easily reached via the municipal road network, the Agriturismo is set not far from a town offering all the necessary services (4km; 5’) and allows easily moving throughout Tuscany thanks to its central location in the region: the papal Pienza (14km; 20’), Montalcino with its renowned Brunello (22km; 25’), the medieval hamlets of Montepulciano (29km; 30’) and Castiglione del Lago (51km; 45’), the city of the Palio, Siena (62km; 1h), the seaside of Maremma (78km; 1h 15’), the turreted San Gimignano (108km; 1h 30’) and the unrivaled Florence (119km; 1h 30’). 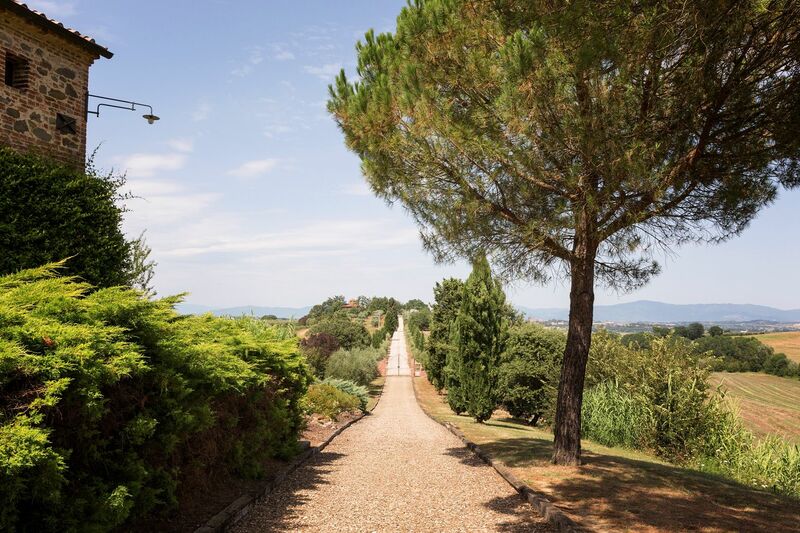 The most convenient airports to reach the property Grosseto Baccarini (83km; 1h 20’), Perugia Sant’Egidio (90km; 1h 10’), Firenze Peretola (136km; 1h 30’), Pisa Galilei (196km; 2h 10’), Roma Ciampino (219km; 2h 20’) and Roma Fiumicino (233km; 2h 20’). 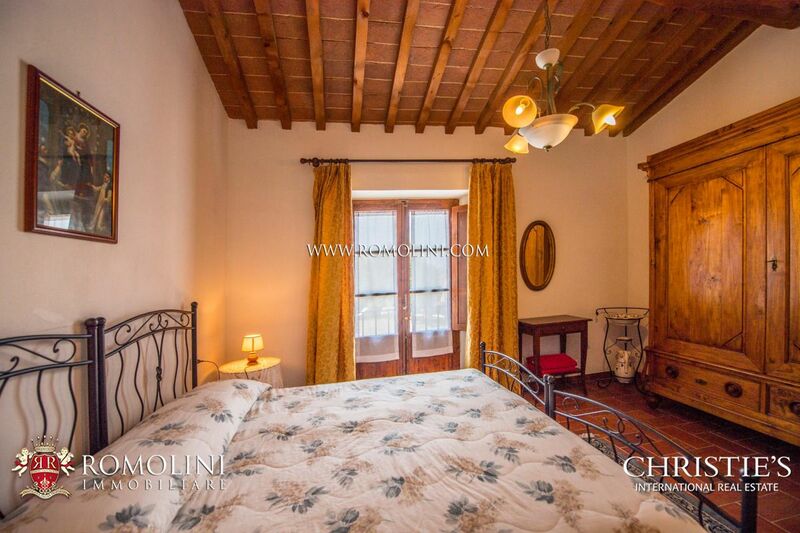 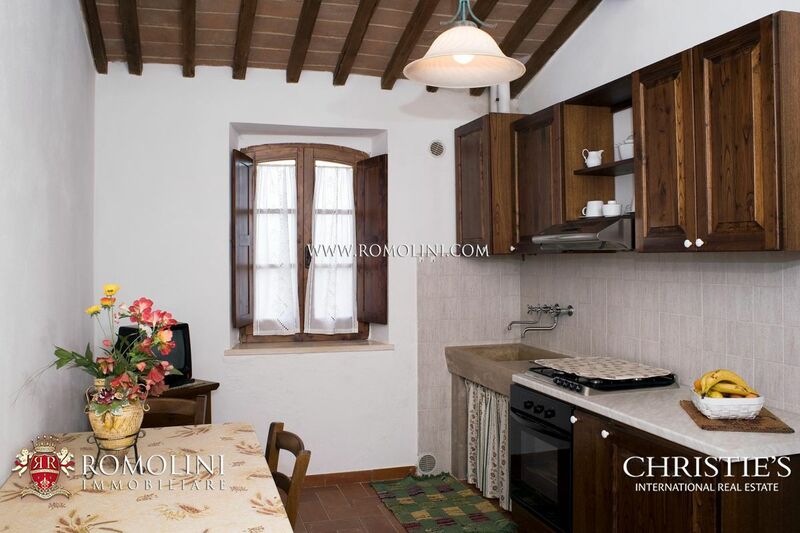 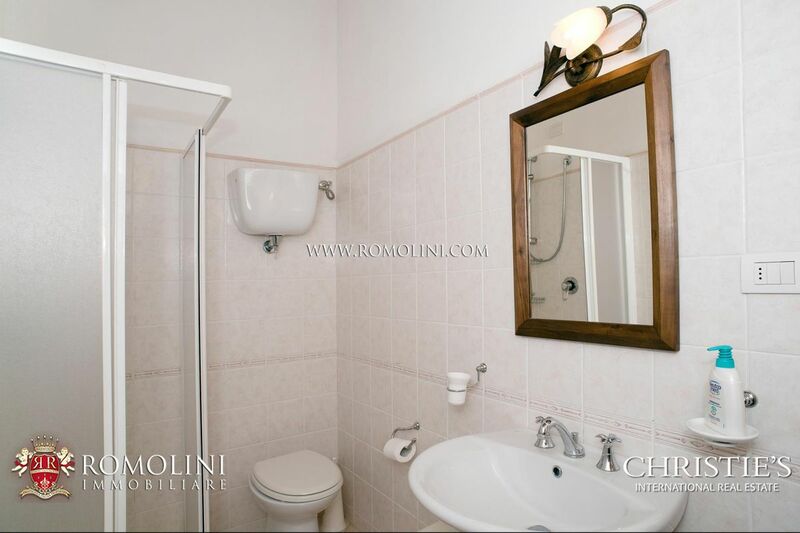 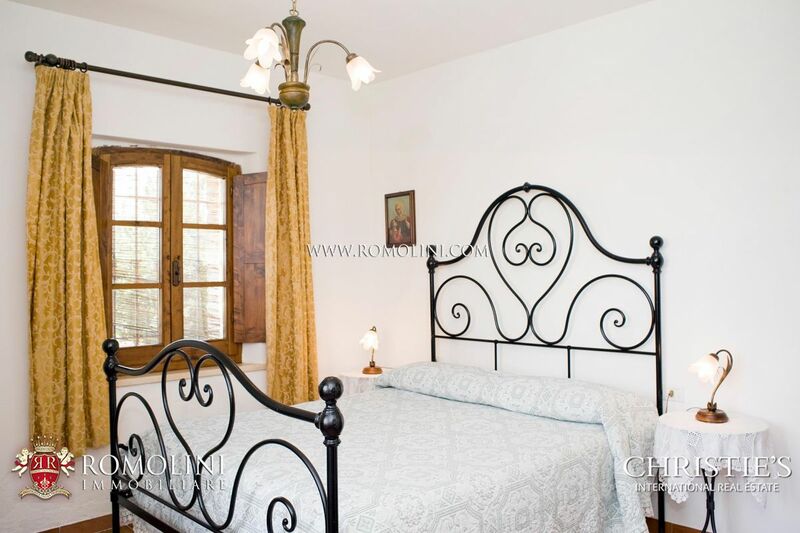 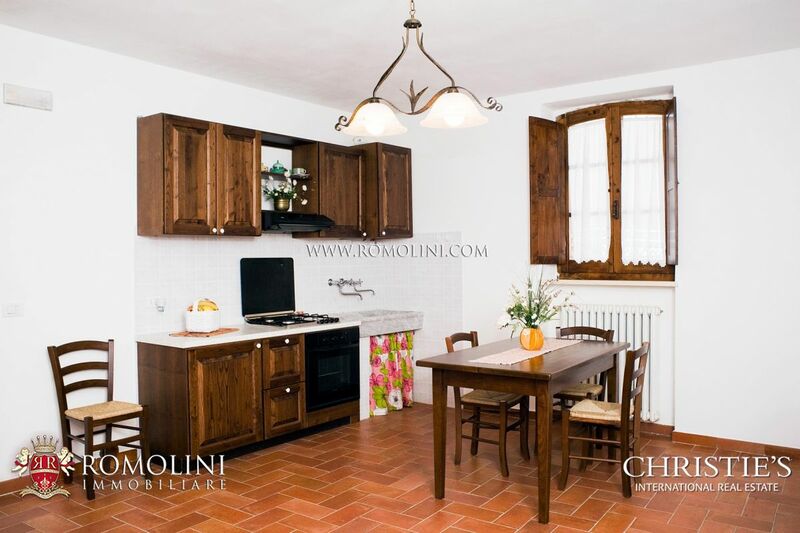 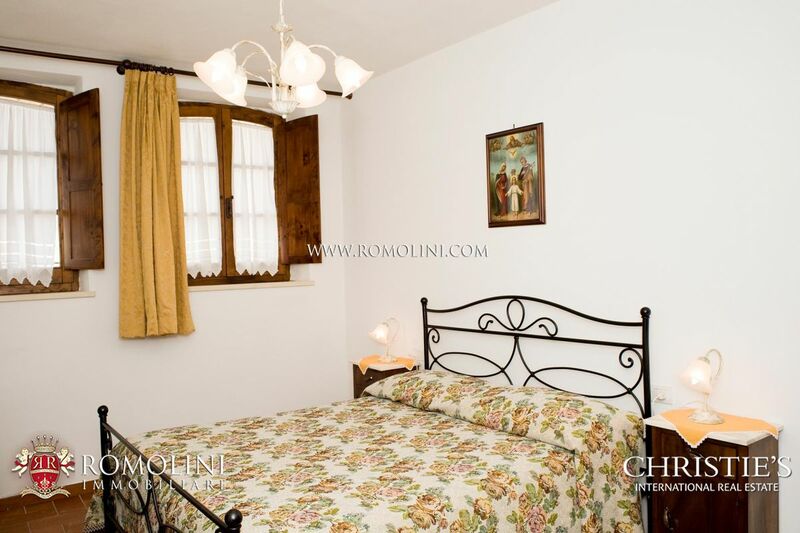 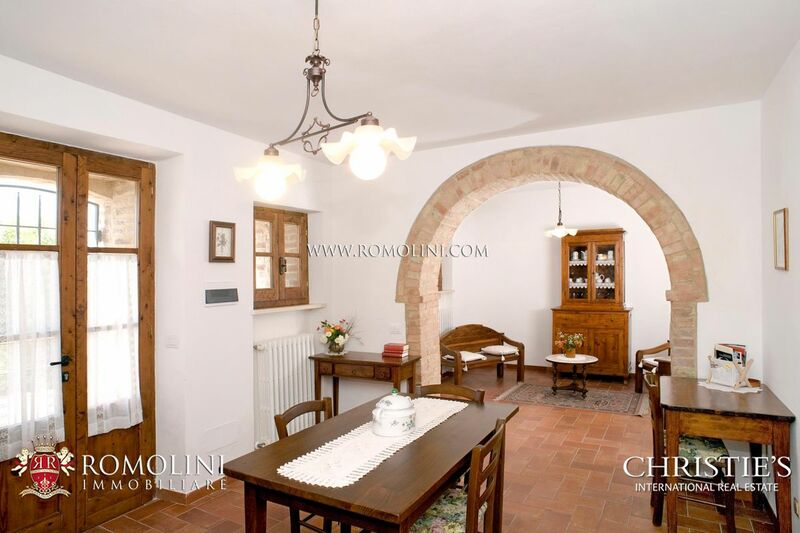 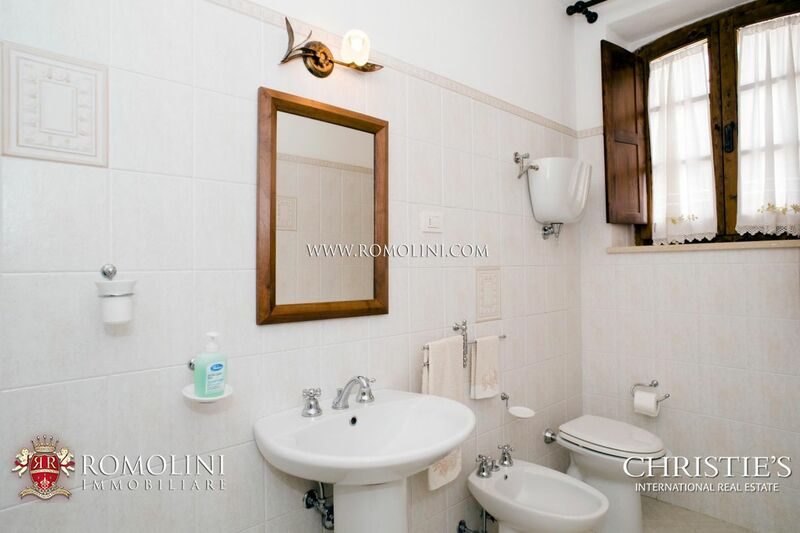 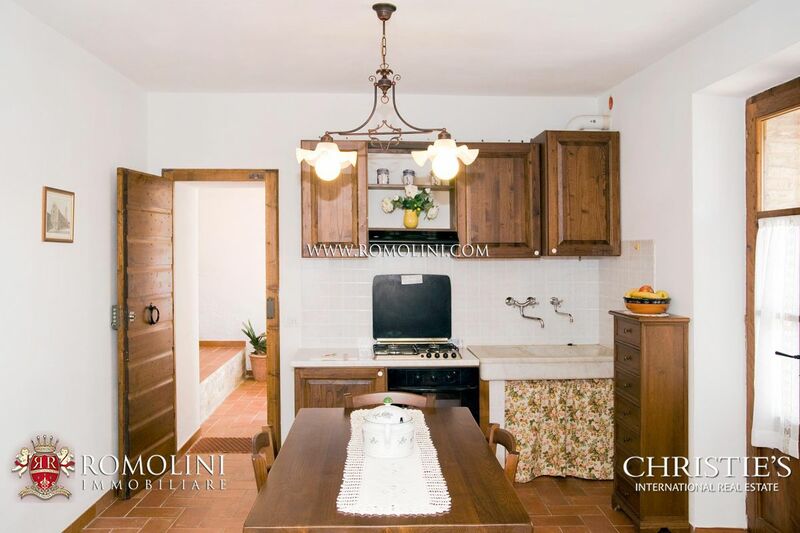 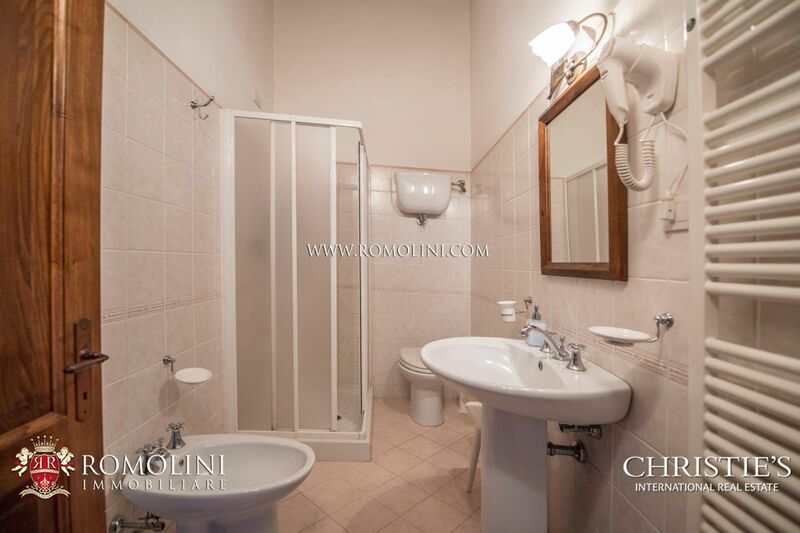 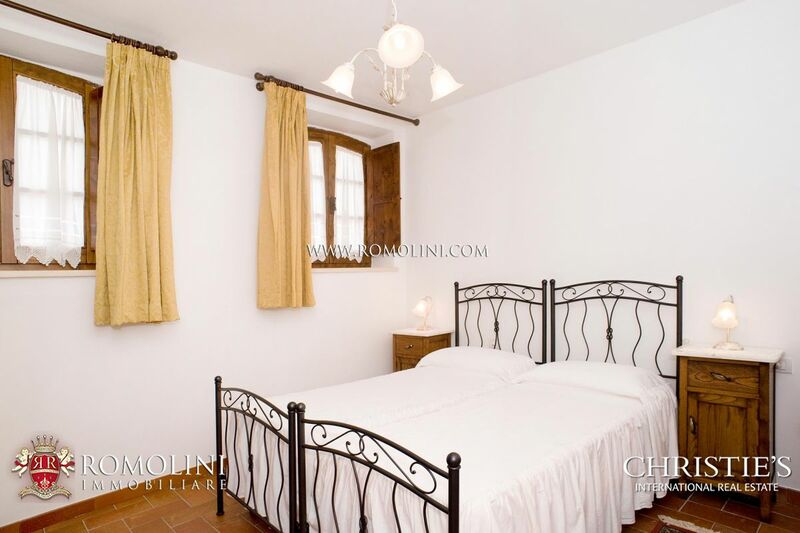 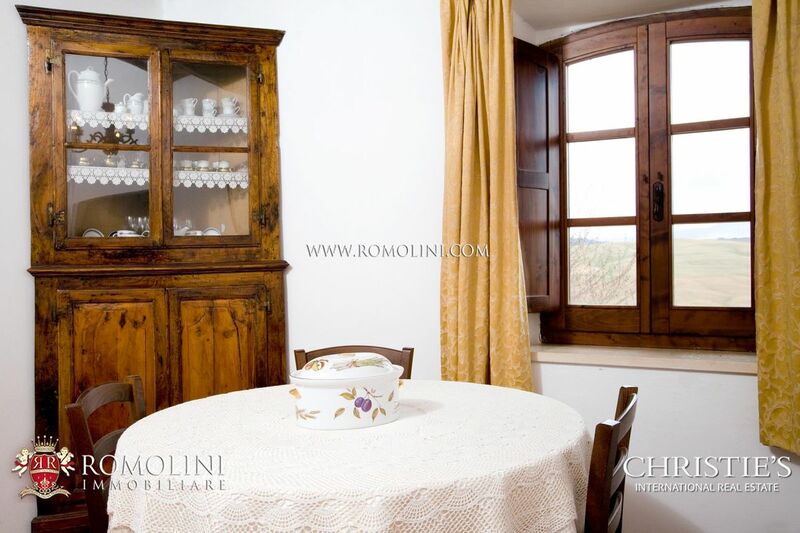 - Apartment N°3: dining room with kitchen, bathroom with shower and double bedroom. 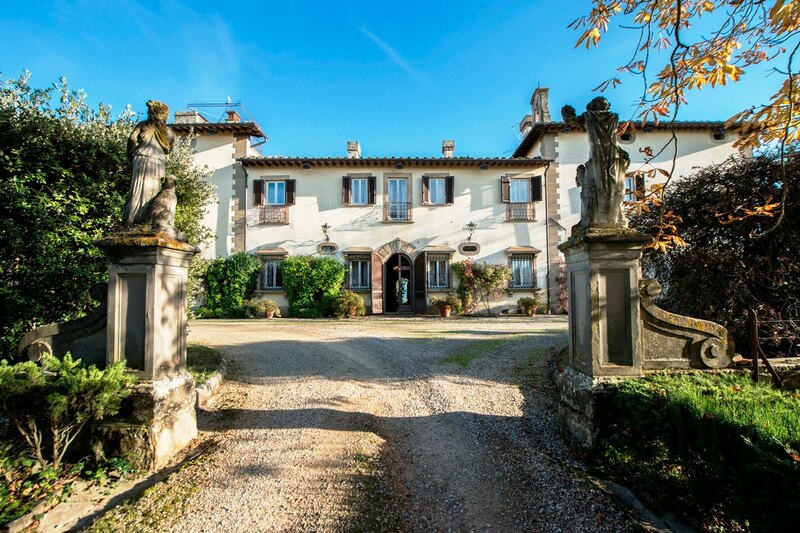 The property was first mentioned for the first time in a document from the 13th century: here a farm is described as built in the same location as the current Agriturismo. 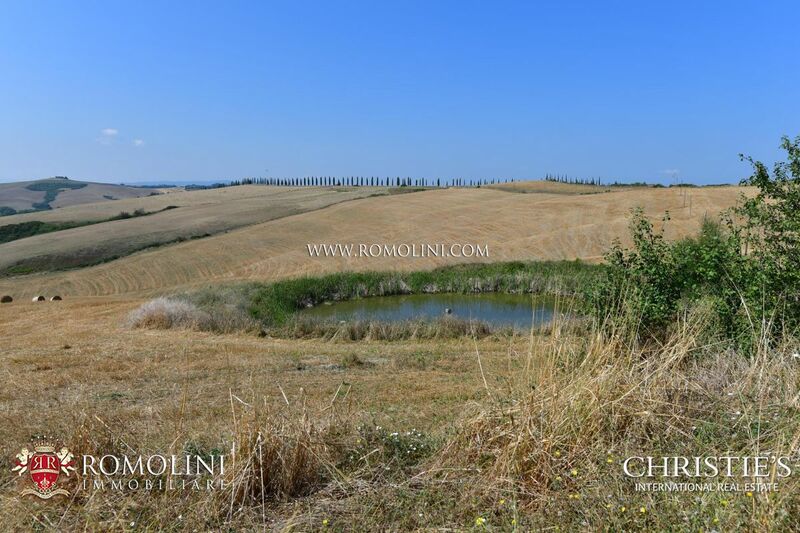 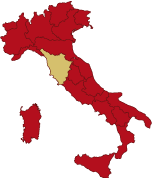 With the fall of the Republic of Siena in 1559 (signing of the treaty of Cateau-Cambrésis) the farm, together with an ample selection of surrounding land was auctioned and then bought by a noble Sienese family. 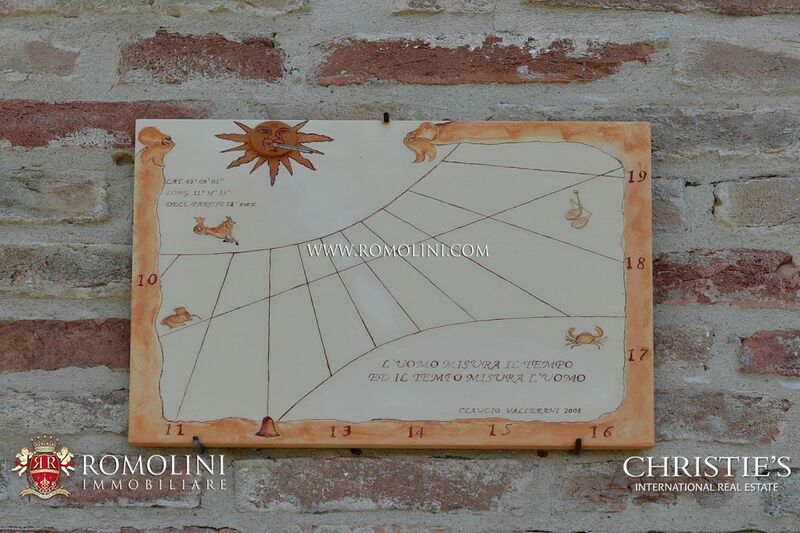 The building was expanded in the following years, with the last works being completed around 1760 (given this date is carved on one of the supporting walls). 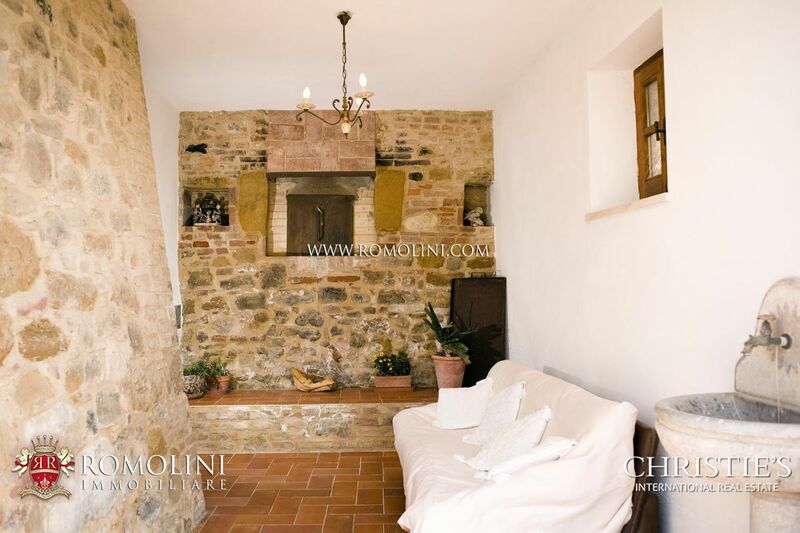 During the restoration, it was discovered that in the Renaissance, where today the annex is located, there was a brick furnace. 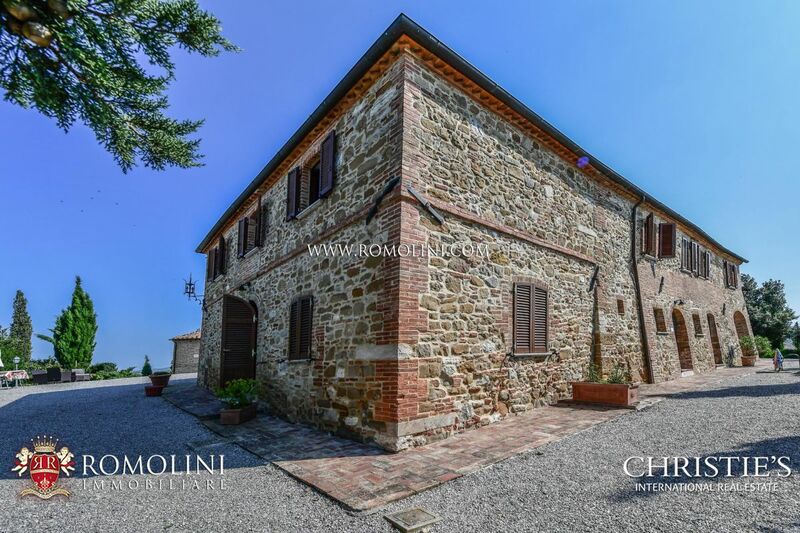 While digging for the underground garage, workers discovered many original bricks which, once cleaned, have been used to pave the outdoor area of the property. 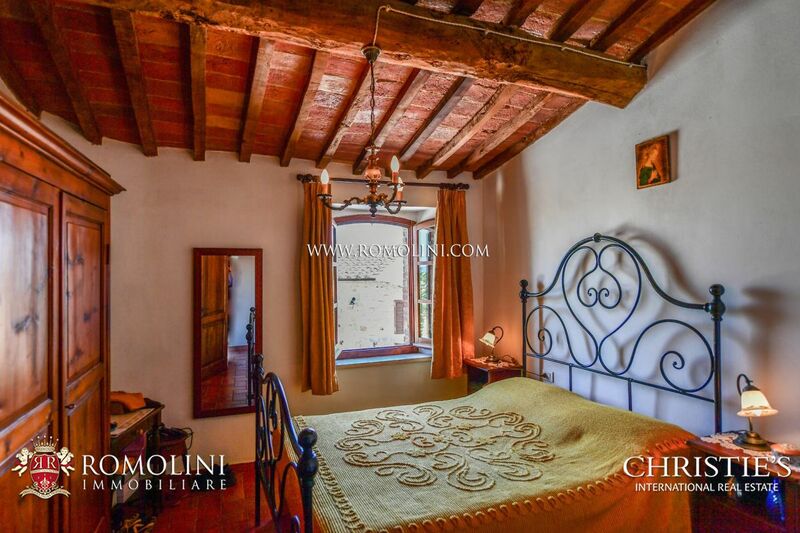 The buildings are nowadays typical Tuscan rustic farmhouses, with supporting walls made out of stone and masonry and all the peculiar traits are still visible, among which wooden beams, terracotta floors, natural wooden bricks and even a unique sundial on the southern wall of the guest house. 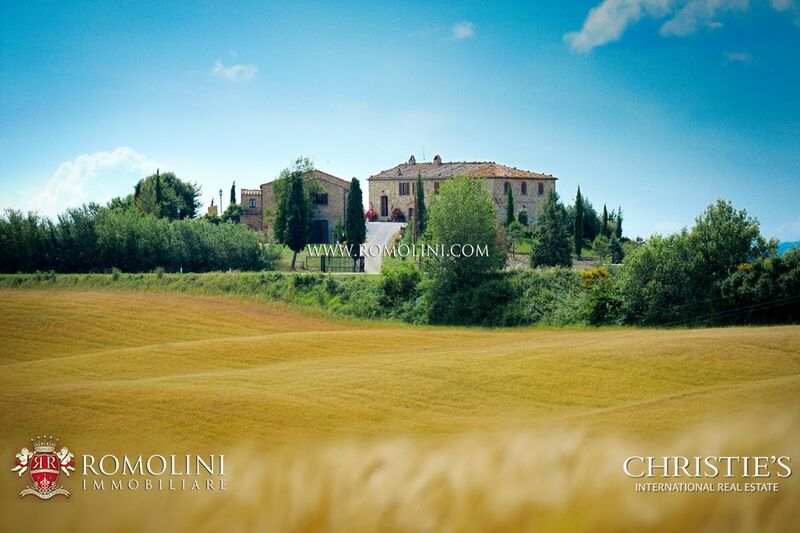 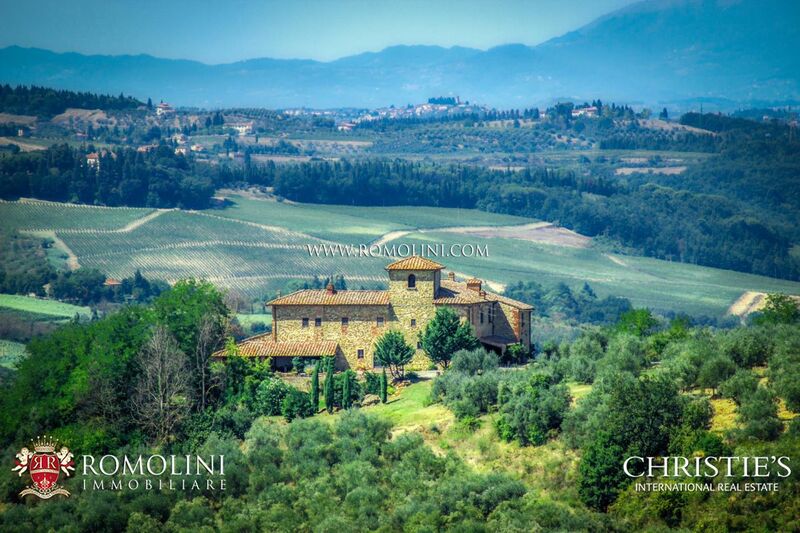 The estate is made up of 43.2 hectares of land, mainly used to produce cereals (41.7 ha). 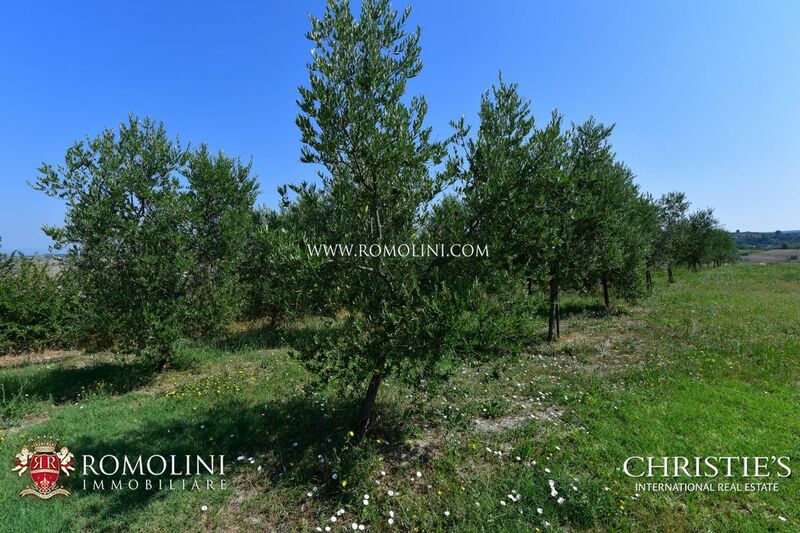 The remaining surface is split between olive grove (1.3 ha) and high woodland (0.2 ha). 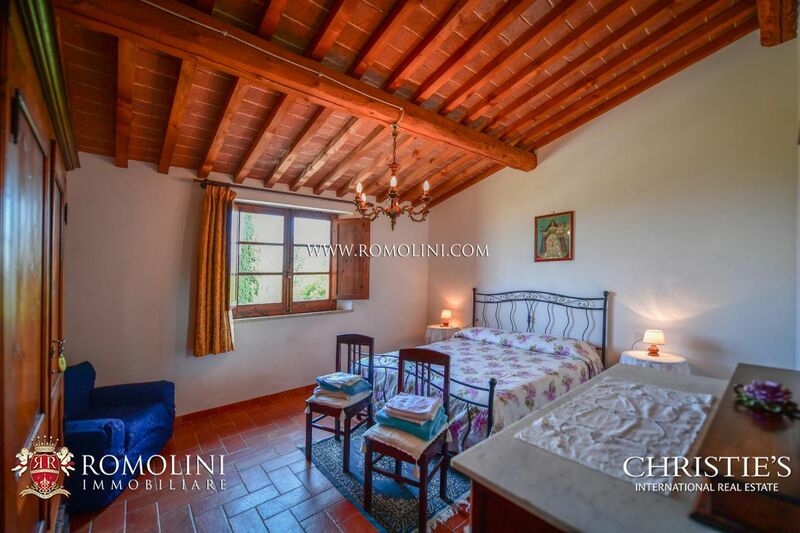 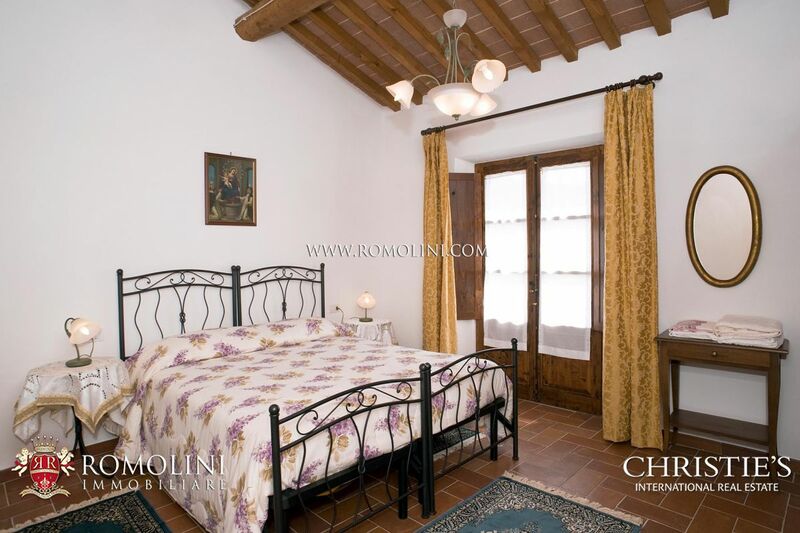 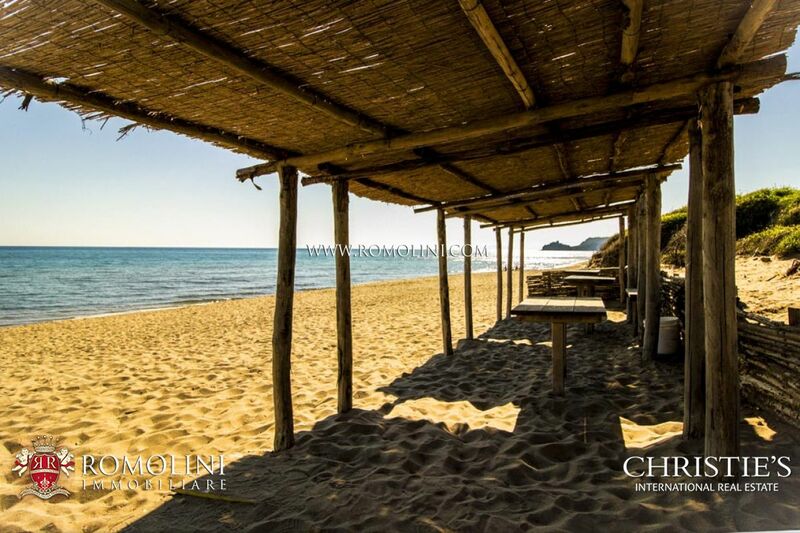 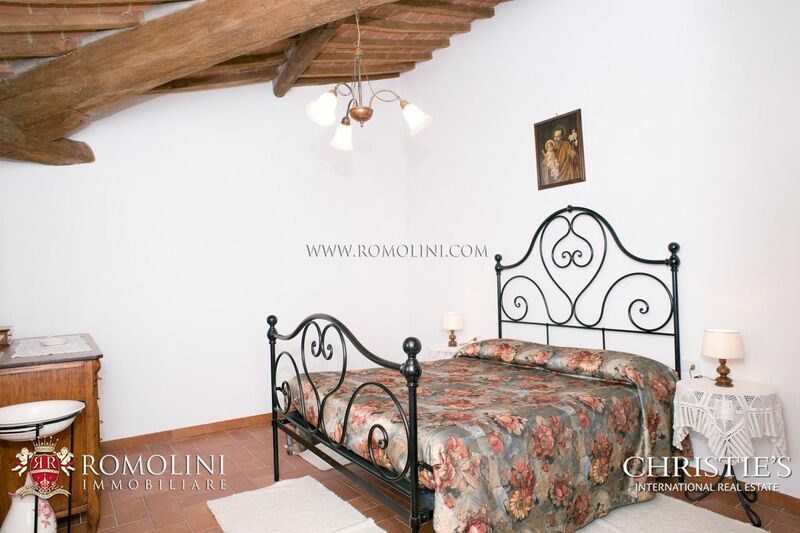 The property is currently run as Agriturismo, with excellent success as testified by many positive reviews on several booking sites. 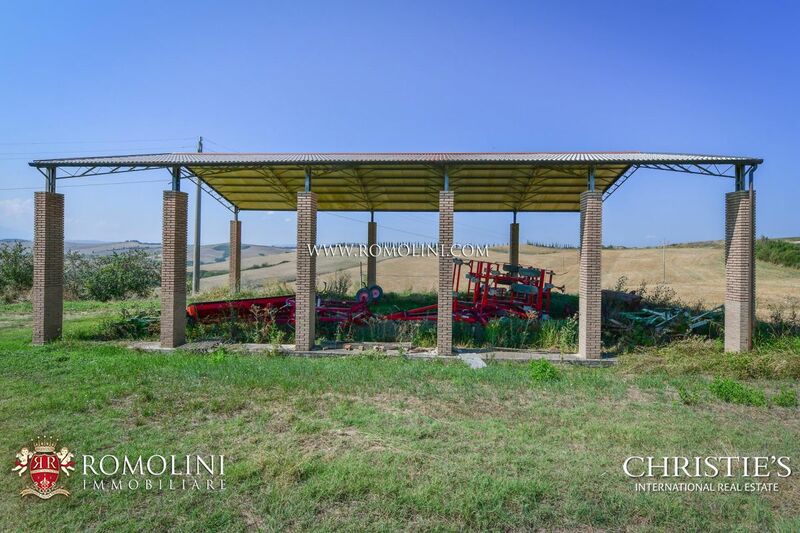 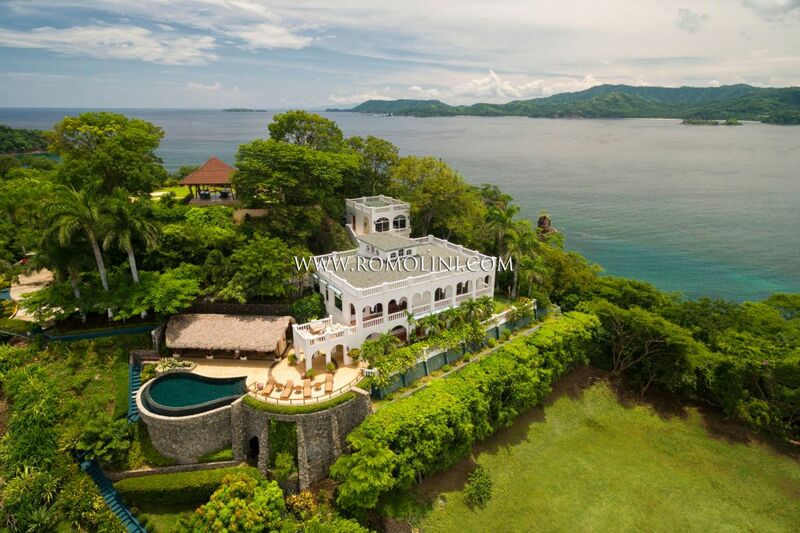 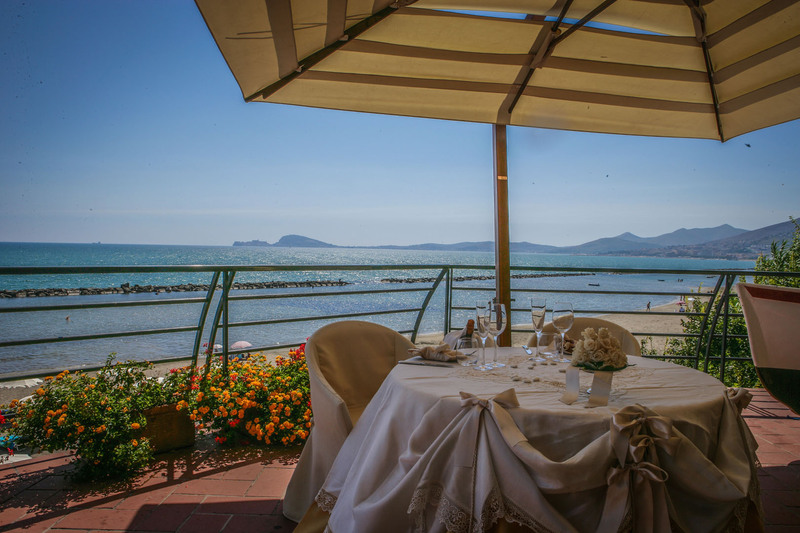 It is clearly possible to keep the business running, considering the excellent location of the property, much appreciated by tourists from all over the world. 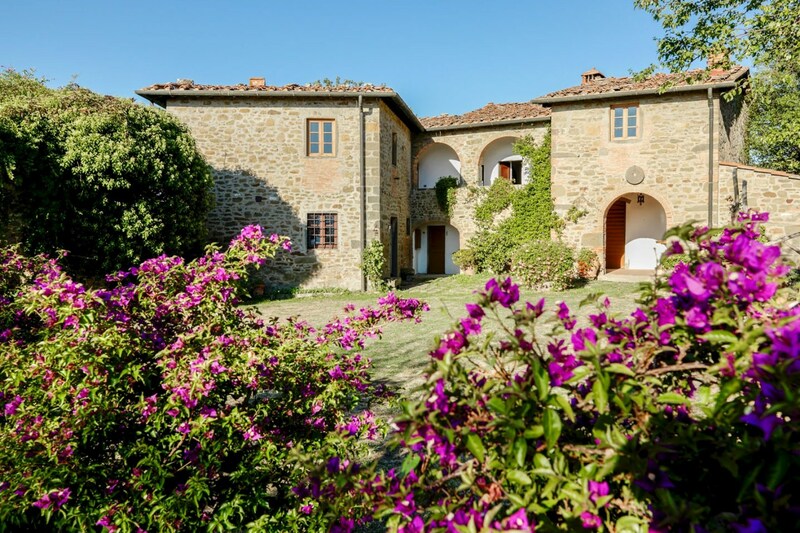 Alternatively, given the quiet location, it is possible to convert the property into a private residence. 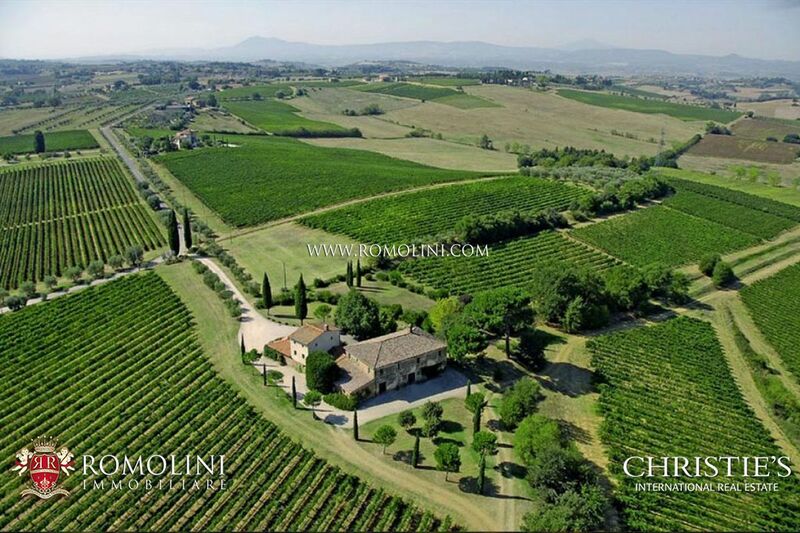 Among the development possibilities, it is worth mentioning the potential plantation of vineyards to produce wine in one of the most renowned locations in the world.